As the kids go back to school this month, it got me thinking about how they need somewhere in the house to do all that homework they’re about to receive! Having a dedicated space which is relaxing and interesting means that it may make homework time just that little bit easier. In the same way you’d want to fix up your own home-office space to feel like a stylish part of your home, it can also be done for your kid’s workspace too! Whether it’s a whole room dedicated to the cause, or a smaller space in their bedroom, there are loads of different ways to create the right space, for little ones and for teenagers. A playroom in the home is a great space for children to have fun in, but as they get older they may need to use the room to study in as well, so finding the right balance between the two is key. I love the look of this room below; it’s a lively, open space that’s full of colour. The interesting shelving units keep the toys at bay whilst homework takes place, and the large table and bean bags instead of chairs gives off a more relaxed vibe, making it suitable for switching in between homework and fun; a good idea for younger kids who don’t need such a regimented work space. I love the idea of using bean bags as a form of seating for your child’s space; making it feel like it’s strictly for kids. However, there are some rather stylish bean bags that, as an adult, I still kind of want. This arrow design from Not on the High Street is lovely, it’s fun enough for little ones, but also has a grown up style that’ll continue to be cool as they get older. If you have a large, beautiful table that’s perfect for the kid’s but you don’t want it forever ruined with pen marks and spillages, investing in a plastic table cover is a good way to go. While I’ve seen some pretty ghastly plastic table covers in my time, they’re not all bad. This clear plastic cover with polka dots from Table Protect Direct is the best of both worlds; sophisticated enough to fit in with your existing design scheme, but fun enough for a kid’s space. Giving your children a stylish place to work in their bedroom means that not only will you get your own space back, but they’ll be more inclined to work there if it feels grown up and personal. It’s also a good idea if you need the work space to be in a bedroom, that you make the space its own individual area so that you can separate work from the rest of the room. I love the look of this work space created for a child; white furniture with pastel accents creates an inviting and fun area which can easily be incorporated into an existing bedroom scheme. A good desk for a kid’s bedroom must be both durable and stylish enough to last for years. A simple design that can be adapted with accessories over time is a good investment, and it’ll help turn a work area into a place where the kid’s want to be. This desk from La Redoute is a great buy; the white lacquered top and interestingly shaped wooden legs gives it a sophisticated but playful feel; with just a hint of mid-century to it. While it’s important to let your child have their own style, sometimes you’ll find that they might want to copy yours (at least for a few years!) So finding miniature versions your own style for your kid’s workspace is a great way to encourage them to work and feel more grown up, especially if you too are at your own desk working. I really like this child’s version of the clear plastic chair design by Kartell that’s been making the rounds for a while now, all it needs is the addition of a seat cushion, something fun like a faux fur sheepskin, to give some extra comfort and style. If you’re limited on space in your child’s bedroom, using some wall-mounted shelves instead of free-standing ones can save you a whole bunch of room. These wooden shelving boxes from Maison du Monde are a good buy, they’ll be able to hold a lot of stuff, plus they’re a fun, colourful way to be organised. As your kids turn into teenagers, giving them their own homework space is even more important. This beautifully designed space is a perfect, mature room; there aren’t any childish items that’ll annoy the brooding teenager, instead they’re presented with somewhere stylish, making them feel more like an adult. A large desk, which is stylish and has space for written and computer work doesn’t have to cost a fortune; Ikea have a rather elegant design to hand. The Alex desk is a simple style that’ll appease all teenage tastes; and will look good in any interior scheme. Giving your teenager some interesting prints to put up on the wall of their homework area will also help to make it feel more mature. Desenio do some cheap but stylish prints, like this banana leaf print of artsy world map, both of which would feel at home in a teenage work spot. Creating a space for your kids to work in doesn’t mean having to skip out on style. You can make high functioning areas that can still look good and feel fun; making the mission to get all the homework complete just a touch more interesting for both you and your child. Maybe it’s my imagination, or maybe I’m just ready for the autumn weather, but as soon as it turns September I feel a little nip in the air. While that may fill some people with sadness, I’m always secretly a little happy, autumn is my second favourite season after spring so I always welcome it with open arms. Making the transition from hot summer evenings to chillier autumn ones can always be made a whole lot smoother if you’re prepared, having your throws, cushions and snuggly furniture ready will mean that you’ll be looking forward to those evening curled up on the sofa instead of out in the garden. I’ve pulled together some wonderful products that’ll make those autumn nights even more tempting. Finding a marvellous throw for the colder part of the year will not only keep you warm, but instantly make a sofa or bed look revitalised. Picking the best material for your throw is a job within itself, Merino wool is made from the Merino sheep, mainly in Australia, and is incredibly soft! I love this patterned throw from Wool Me, the red and green design will pop next to a pale coloured sofa, or help create a moody feel on a dark shade. If you’re looking for a throw that is outrageously soft, you can’t go wrong with a Mohair throw. Heal’s currently have a Mohair throw in five gorgeous colourways, but my particular favourite this the pastels shade. It looks perfect spread across a bed just like below but would look equally fabulous draped over an armchair when not in use. Those nights where you’re inside watching a film, or reading a book instead of enjoy a summer’s evening can be made a whole lot easier when you have a wonderfully comfy sofa or armchair to curl up on. Loaf have produced a collection of sofas and armchairs, or as they lovingly call them ‘squishy’ chairs, that look like the King and Queens of comfort! Two of my favourite looks from their collection are the Snuggalump sofa and the Crumpet armchair, they both have extra thick cushions so you can get yourself well and truly comfy in one of these. If you’re all set for sofas, but are still looking for something to snuggle up in, this cocoon from Graham & Green may be your sort of thing. Its design is perfect for anyone who loves playful and contemporary pieces, and if you love vegging out on a Sunday afternoon! Getting your interiors ready for autumn doesn’t necessarily mean you need to kit your home out in those typical autumn colours, if you prefer the bright and bold scheme then go for it! Cushions are a quick and fun way to inject a bit of colour into your interior, plus they’ll really spruce up a room with minimal effort. These Frida cushions from Graham & Green are fantastic, they use abstract imagery of the iconic artist (and her parrots!) to create some playful cushions. Use intermittently in a set of scatter cushions or go all out and use all in a row to really make a statement. 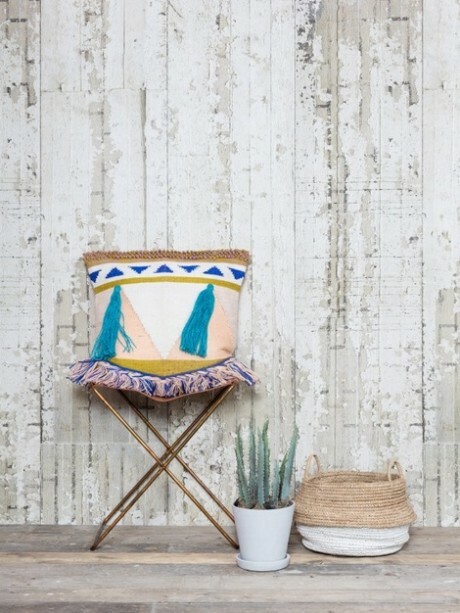 If you fancy something a little less bright but just as fun, head over to Trouva for this snazzy tassel cushion. It’s ideal to give a space some character, and a hint of Mediterranean feel. A great way to make your bedroom feel extra comfy for autumn is with a new bedspread, although it may not make it any easier to get out of bed in the morning! I absolutely love this velvet and linen bedspread from Niki Jones, it looks like you could wrap yourself up in it all day! If you’re not quite ready to let go of summer, this beautiful duvet set from Houseology cannot be missed! The wisteria pattern will help you get through the colder months as you dream of summer. Autumn is on the horizon and whether you’re happy or sad about it, one thing you can’t argue with is how much fun you’re going to have creating your perfect snuggly autumn retreat! I love the autumn and it only takes a whiff of a bonfire or a slightly chilly breeze in the air to get me thinking about cozying up my home for the cold weather. Whilst we are generally enjoying a gorgeous autumn, I am not to be deflected and am taking the opportunity to add a few seasonal accessories, so where better to start than with a bit of natural sheepskin. And if you are won over by a picture of a chair with a sheepskin on it, why not go the whole hog (sheep) with a sheepskin beanbag. Fall into it, and emerge in the spring. If you have a bigger floor space to be filled with under foot joy, look no further than The Rug Company. Their Alpaca rug not only looks wonderful but is as tactile as you could possibly desire. On a slightly more frivolous note, I love this sheepskin sheep footstool by The Wool Room at Not on the High Street. I almost feel like naming it, but I will control myself. We have featured it before and I still love it – why not have a sheepskin magazine rack? And finally, whilst not given to exaggerated sentimentalism myself (she says), I couldn’t resist this sweet heart shaped sheepskin cushion – well why not?